Just like people, dogs and cats can have allergies too! An allergic reaction occurs when your pet’s body has an adverse response to environmental substances, which can range from hardly noticeable to potentially fatal. Most reactions occur when the allergen is inhaled, ingested or comes in contact with the skin. Like humans, specific allergies are unique to each pet. In New York, common allergens include pollens, mold spores, dust, cigarette smoke, foodstuffs, prescription drugs, household cleaners and shampoo. 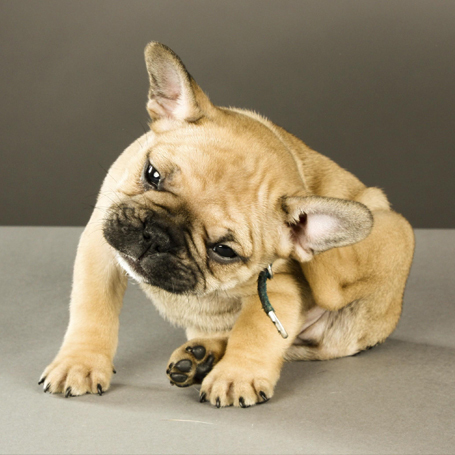 Unfortunately, determining the cause of your pet’s allergic reaction can often be difficult due to the large number of substances they interact with on a daily basis. Using a small blood sample taken from your cat or dog, our laboratory services test common environmental and food allergies, measuring any reactions to discover possible allergies, as well as their severity. This type of testing does not require your pet to be shaved. If you suspect your pet has allergies, please contact your Syosset Animal Hospital veterinarian. Using your pet’s medical history, a comprehensive physical examination, blood tests and an elimination diet, your veterinarian can discover what your pet’s specific allergies are. Once determined, your Syosset Animal Hospital veterinarian will then design a customized allergy regimen that involves removing environmental and food-based allergens from your pet’s daily routine where possible, instituting allergy injections, as well as prescribing pet allergy medications if necessary, dramatically improving your pet’s quality of life. Apoquel is an innovative new prescription drug used to treat allergic dermatitis in dogs. Unlike previous allergy medicines, which have been generally a steroid, cyclosporine or antihistamine, Apoquel belongs to a class of drugs called Janus Kinase inhibitors. This new type of drug more effectively targets the source of allergies and is approved for long-term use. Apoquel is the first drug in this class that has been FDA-approved for veterinary use. Apoquel is for dogs over the age of one. Treatment consists of two doses per day for the first two weeks and one dose daily afterwards. Your Syosset Animal Hospital veterinarian will determine if Apoquel is appropriate for your pet.